Your pet's regimen of everyday care is the cornerstone to happy, healthy days. Dental disease and its serious consequences can be avoided by bringing your pet for its yearly health exam. Cats specifically, harbor more silent viruses than most animals and can be the leading cause for dental disease. This is why Long Trail Veterinary Center offers dental exams, radiographs, and cleanings/extractions. Dental care does not end with a visit to your veterinarian. We recommend continuing efforts at home by brushing your dog's teeth as part of a home dental care regimen. We understand that this is difficult for many dog owners and that busy schedules often interfere. This is why we have other methods available to aid you in slowing down plaque and tartar build-up. For cats, as well as dogs, there are diets that assist in the decrease of calculus build-up. The most common teeth that are affected in cats and dogs are the fourth premolars, which are not as visible or accessible for you to see. 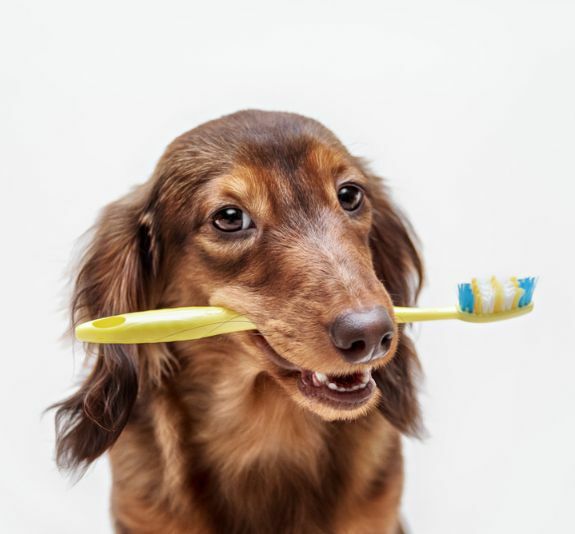 Any member of our staff can show you the proper method of brushing your pet's teeth as well as help you select the most effective dental products for your pet.